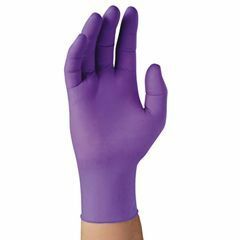 These PURPLE NITRILE Sterile Pairs meet tough tasks head on. Latex-free, these gloves are made primarily of acrylonitrile-butadine, which reduces the chance of allergic reactions to natural rubber latex. The distinctive COLOR PURPLE helps users immediately distinguish these gloves from other latex or synthetic gloves. Well-packaged. Comfortable. Sturdy. Easy To Use. Cathing away from home. On-the-go. These are some of the most comfortable gloves I have ever put on, if nothing else, and they are nice and sturdy. I've not had a single one rip or tear when using them, which I cannot say with any other gloves I have ever used. I am a paraplegic and often need to cath when I'm away from home. I want to make sure my hands are clean when I cath, but I don't feel confident about the kind of clean I can get with hand wipes and sanitizers. I stick these gloves in my travel bag and pop them on when cathing to get an "instant clean" set of hands. Sometimes, I cut the paper envelope they come in in half and just take one so I cath with one clean and one not-so-clean hand. Again, it's not absolutely necessary for my hands to be sterile, just really clean. If I put non-sterile exam gloves in my bag, I'm afraid they would pick up dirt and/or bacteria. These gloves come with a sturdy outer wrap and are folded in paper inside that, so I'm confident they will STAY clean. Since I have been using these gloves, I haven't had a single UTI, so I'm going to keep on buying them! Easy To Use. Does not tear easily.. Sterile field for cath.. Economical to use. None irritating.. Great packaging.. Great packaging.. Easy to open..
On-the-go. Daily use.. Stores easily.. Packes easily.. These sterile gloves are of good quality and reasonable cost. by Active wearer from Boston, Mass. Easy To Use. Unnoticeable when worn. Comfortable. Durable. When sterility is needed. Self-Catheterization. Wound Care. The greatest thing about these gloves is they're so comfortable when you're wearing them that you can hardly tell you've got them on. The textured fingers make it easier to hold anything you need to hold on to. The fact that they're built similar to rubber (while still being latex-free,) is a plus because they almost never break when you're doing something where you need to stay sterile and their Vinyl counterparts would tear to shreds. This form instructs to also talk about any negatives about the product, but I honestly haven't found any yet. best sterile gloves in size large ! Easy To Use. no latex, no powder;great. We use these to catheterize my son. great product! We tried a lot of other brands and they were too small or had itchy powder in them or smelled bad. These are great!